Tiny Love Magical Night Mobile Review: Mom and Baby Love It! 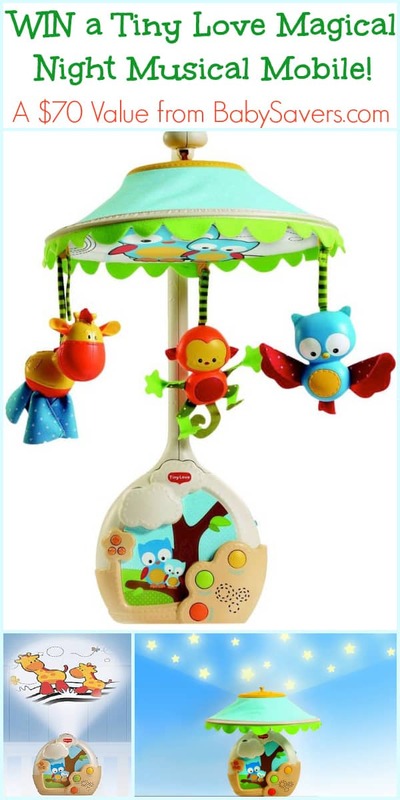 This Tiny Love Magical Night Musical Mobile review was written by Leah, a new contributor to BabySavers.com. 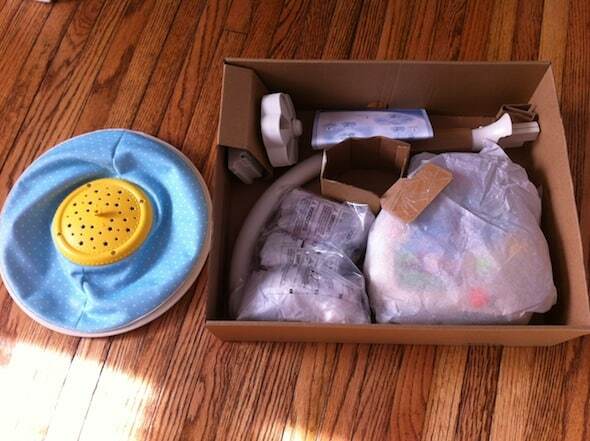 Leah is a crafty and creative mom to three adorable children. She and her husband are constantly starting (and completing!) home improvement projects while balancing family, fun and friends. 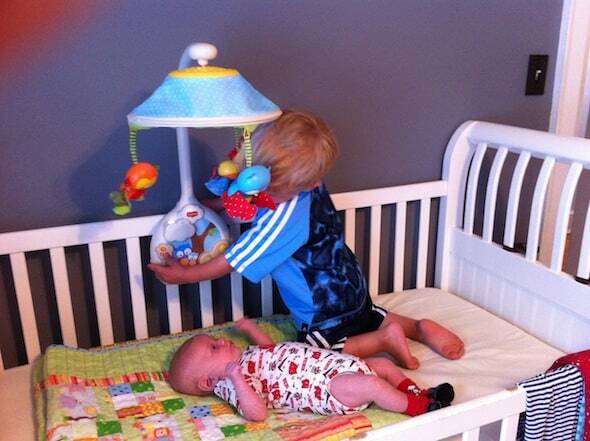 With our first child, my husband and I quickly discovered the benefits of a crib mobile. Ellen loved to watch the animals dance around above her head, and we loved that we had a few extra minutes to get things done around the house. By “a few extra minutes,” I mean just that. The mobile that we were using was an older crank version, and it only ran for about five minutes. We used the same mobile for our second child, and after driving myself crazy cranking that mobile over and over for Felix, I was determined to get a newer battery powered version for our third child, due Spring 2013. This is one product that I wish I had on hand for all three of my kids as babies! Not only was it easy to assemble, it is easy to use. 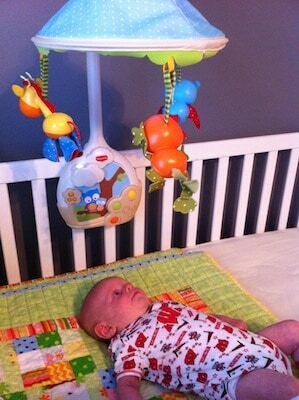 As a matter of fact, we used the mobile at all of the different settings before we even had it installed on the crib! The volume control is easy to find in the middle of the night, and the selection of music (lullaby, classic, or nature sounds) has the whole family humming along. An added benefit to this mobile is the mute button! I find that most kids’ toys have two volumes: loud and louder. The mobile defaults to a mid-range volume setting, and we actually have the option to dial it down a couple of notches. The mobile is also fun to look at: The owl, giraffe, and monkey figures that hang from the canopy are darling, and the projected stars are fun for the older kids and parents to watch as well. One thing that I should mention about the Magical Night Mobile is the rather loud running noise from the motor. Our boys are very light sleepers, and they benefit from a sound machine at night. Because of this, I am used to white noise, which is what the motor sounds like. Baby Emmett’s crib is still in our room, and I find that the motor sound is calming and lulls me to sleep. I can, however, understand that others may find that annoying. Other than that, I doubt anyone would find fault with this wonderful item! Because the Tiny Love Magical Night Mobile converts to a lamp, we will have this in Emmett’s room for a very long time, as opposed to so many baby items that are only used for a few months! Want to buy a Tiny Love Magical Night Mobile? The mobile has a suggested retail price of $69.99, but it can usually be found for a bit less on Amazon. Right now you can buy the Tiny Love Magical Night Mobile for $59.99 with free shipping! Want to win a Tiny Love Magical Night Musical Mobile? Please use the easy giveaway form below to record your entries. The comment entry is the only mandatory entry you must complete to be eligible to win. All other are purely optional and simply give entrants additional chances to win. Disclosure: This Tiny Love Magical Night Mobile review was made possible by Tiny Love. Tiny Love provided the product to the reviewer at no charge. All opinions and thoughts are authentic and honest. I would love to get this for my baby girl! My favorite feature is the three different stages for use! I love the projection. How cool! We have a arch that clamps onto just about anything from Tiny Love–one of our best purchases! Would love to add this to our collection! So cute. Love that it is gender neutral and can grow with your baby! I love the projector feature and also the mute feature as well. I like the projection feature! White noise or the loud motor sound is perfectly fine for our baby do we don’t need to tip toe around once baby is down. Cute animals! Very appealing! I love all baby products that grow with your child and this one does it to, so I’d say that is my favorite thing about this item. I love the fact that tour child can still use it as they grow older. I like that it converts to a music box as well. I like the fact it converts to a music box with ceiling projection and the 7.00 coupon off it on Amazon right now! I love that it plays 30 minutes of continuous music. This would be sooo nice for my little one, I’d love to win! My favorite feature is that it converts to a music box with ceiling projection for older babies. I like that you can change up the song, the mute button and that it turns into a lamp. Its like the transformer of the crib mobiles! I love that it “grows” with baby and can be used as a light after baby stage! I would love to have this for my baby girl. That’s so awesome that it converts to other things as your baby grows! I have had my eye on this one since pre-order!! I would love to win!! I like that its so versatile and can be changed as a child grows and can do different things. It’s so neat. I just had my third baby and he would love this to look at while I tend to my girls.